Hochwertiges Qualitätspuzzle, mit unterschiedlich geformten Teilen und intensiven Farben. This dolphins play in the water, waiting for you to dive in. 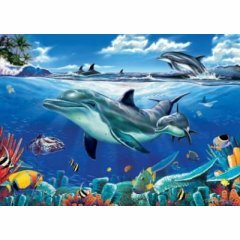 Great picture, very popular theme, high quality jigsaw puzzle, excellent gift for every puzzler.